Despite Chad’s recently acquired status as an oil-exporting state, most of the population of the semi-desert country continues to live in poverty. Chad has been plagued by a succession of conflicts from the 1960s up to the Libyan conflict of the 1980s, leaving behind a deadly legacy of landmine contamination and other explosive remnants of war (ERW). Ongoing clashes in the country, as well as in neighbouring countries demonstrate how non-state armed groups can exploit instabilities and pervious borders. The presence of great amounts of unsecured explosives increase the likelihood of their entering the black market, which further impacts the country's stability. Clearing contaminated areas remains one of the major challenges for Chad, both in terms of saving lives and advancing development. It is estimated that 300,000 people are living under the constant threat of anti-personnel and anti-vehicle mines. These often invisible, yet fatal enemies obstruct safe access to housing, roads, water points, and pastures. Their negative impact on the socio-economic development of the country is particularly severe in the regions of Borkou and Ennedi in the North, which are also among the country’s poorest areas. In light of this situation, GCS was commissioned by the international aid organisation Humanity & Inclusion (HI), formally known as Handicap International, to supply a comprehensive mechanical landmine clearance solution for the EU-funded project "Support for mine clearance, development and the social protection of vulnerable people". This project is in consortium with the Mine Advisory Group (MAG), Le Secours Catholique et Développement (SECADEV) and the Fondation Suisse pour le déminage (FSD) and aims to identify and clear areas affected by mines and explosive remnants of war, and to promote overall development in Borkou and Ennedi. Since last November, Humanity & Inclusion’s mine action team has cleared more than 30,000 square meters of land in the area, yet there are more than 1.5 million square meters of land still estimated to be contaminated by explosive remnants of war. 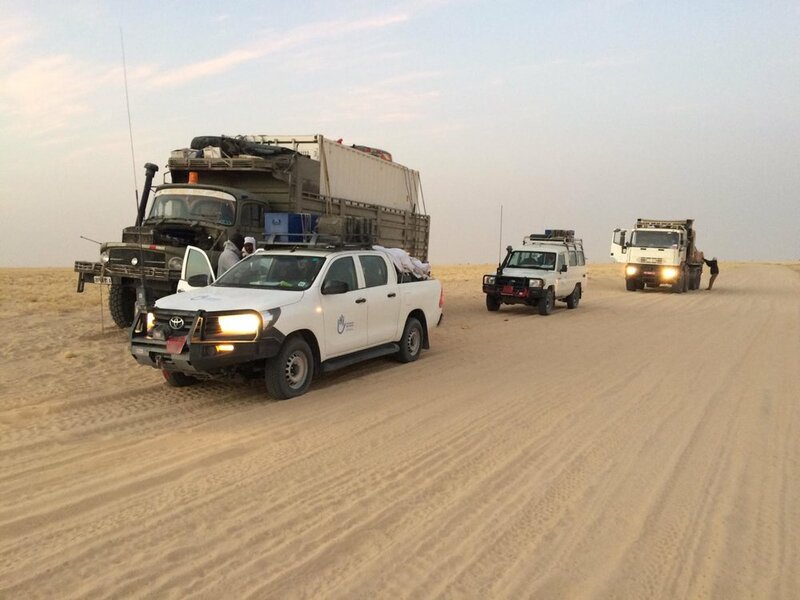 HI specifically required a versatile remote-operated system that can use several types of tool attachments and be easily implemented in the harsh environment of the deployment ground in Chad. The GCS-200 was selected as the best fit. This product is an unmanned multi-purpose EOD platform designed for heavy-duty clearance tasks with maximum survivability in high-threat environments. The transport of the GCS-200 and equipment to the area of operations was no small feat. Due to a number of unforeseen logistical obstacles in the process, GCS Global Technician Chris Thompson was sent to N’Djamena to assist HI with the transportation. 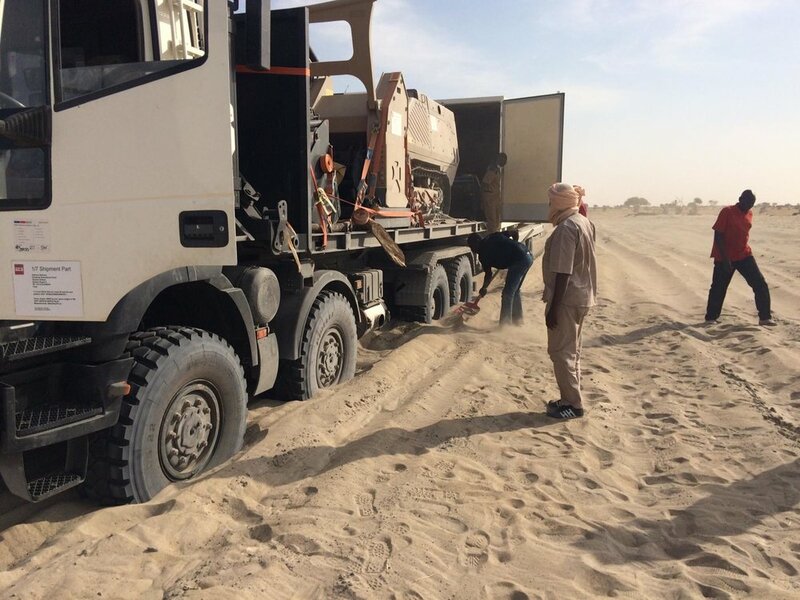 This entailed the accompaniment of a truck, trailer workshop, spares container and the GCS-200 mine clearance machine on an over 1000 km uncompromising desert overland transport mission to Faya. This additional effort on behalf of GCS, was offered as additional support to HI in order to alleviate HI of additional logistical overwhelm and went beyond the contractual agreement between HI and GCS. The transport of the GCS-200 and the other equipment from Germany to Chad is the type of service support that the GCS Customer Suport Team provides to GCS customers. GCS Technician Chris Thompson prepared all of the equipment and conducted a successful 4-week training program for three local HI operators to learn how to operate and perform maintenance tasks on the equipment. In February 2019, in order to speed up the demining process on the 1.5 million square meters of land still estimated to be contaminated, the HI team began working with the robust GCS-200 remote controlled tracked armored vehicle, that detonates hazardous devices in its path. GCS will also provide mentoring and service support to HI’s operators and mechanics during their daily operational activities which will enable them to gain more confidence and proficiency in using and maintaining the equipment. This approach will facilitate maximum output of the equipment in Chad’s challenging environment. GCS intends to be present on the ground for at least a few more months to support HI with technical and operational know-how and support as the project progresses.